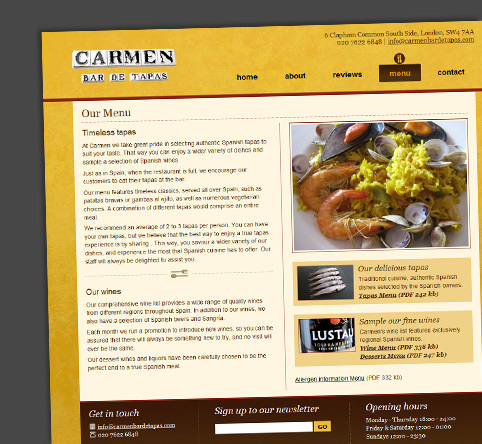 Our lovely client at Carmen Bar de Tapas sent us a very nice testimonial last week after we launched their new website. 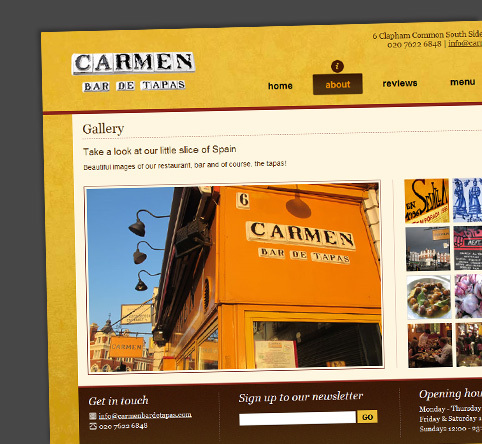 We have also included Carmen Bar de Tapas as a case study on our website as we’re very proud of this site (as we are with all the sites we produce!). Here are some more images of the site. I love the look of this site, and in particular how your design really shows off the fabulous photographs. You really get a sense of who they are. Makes me want to go and savour the atmosphere. Tina joined us at the end of January 2009 and has a degree in illustration from Kingston University. She will be attending the monthly Athena Mayfair networking event meeting new and existing clients. "Since working at Top Left Design I have realised how devoted the team are to great design and customer service." she says. She enjoys working with the Top Left Design team and learning new things about the web design industry.